Summary: According to a new study, musicians have the edge when it comes to reaction times for auditory, visual and tactile processing. Could learning to play a musical instrument help the elderly react faster and stay alert? Quite likely, according to a new study by Université de Montréal’s School of Speech Language Pathology and Audiology, part of UdeM’s medical faculty. 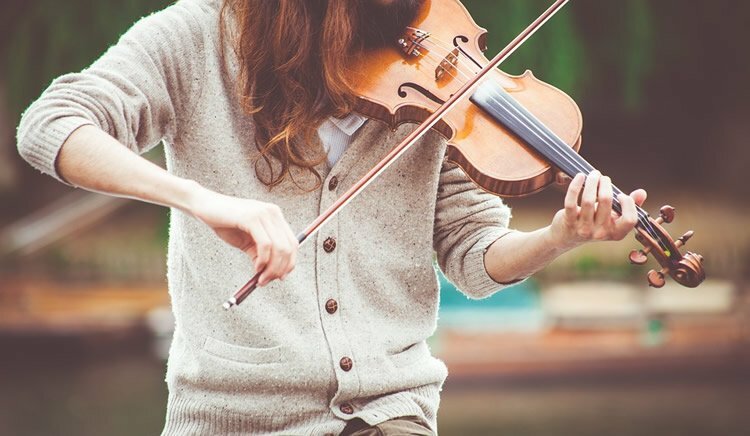 Published in the U.S. journal Brain and Cognition, the study shows that musicians have faster reaction times to sensory stimuli than non-musicians have. And that has implications for preventing some effects of aging, said lead researcher Simon Landry, whose study is part of his doctoral thesis in biomedical science. “The more we know about the impact of music on really basic sensory processes, the more we can apply musical training to individuals who might have slower reaction times,” Landry said. In his study, co-authored with his thesis advisor, audiology associate professor François Champoux, Landry compared the reaction times of 16 musicians and 19 non-musicians. They were sat in a quiet, well-lit room with one hand on a computer mouse and the index finger of the other on a vibro-tactile device, a small box that vibrated intermittently. They were told to click on the mouse when they heard a sound (a burst of white noise) from the speakers in front of them, or when the box vibrated, or when both happened. Each of the three stimulations – audio, tactile and audio-tactile – was done 180 times. The subjects wore earplugs to mask any buzzing “audio clue” when the box vibrated. “We found significantly faster reaction times with musicians for auditory, tactile and audio-tactile stimulations,” Landry writes in his study. The musicians were recruited from UdeM’s music faculty, started playing between ages 3 and 10, and had at least seven years of training. There were eight pianists, 3 violinists, two percussionists, one double bassist, one harpist and one viola player. All but one (a violinist) also mastered a second instrument, or more. “We found significantly faster reaction times with musicians for auditory, tactile and audio-tactile stimulations,” Landry writes in his study. NeuroscienceNews.com image is for illustrative purposes only. The non-musicians were students at the School of Speech Language Pathology. As with the musicians, roughly half were undergraduates and half graduates. Landry, whose research interest is in how sound and touch interact, said his study adds to previous ones that looked at how musicians’ brains process sensory illusions. “The idea is to better understand how playing a musical instrument affects the senses in a way that is not related to music,” he said of his study. Funding: Funding came from Canadian Institutes of Health Research, Fonds de recherche Québec – Santé, and Natural Sciences and Engineering Research Council of Canada. University of Montreal “Musicians Have Faster Reaction Times.” NeuroscienceNews. NeuroscienceNews, 10 January 2017. University of Montreal “Musicians Have Faster Reaction Times.” http://neurosciencenews.com/musician-reaction-time-5909/ (accessed January 10, 2017). The results from numerous investigations suggest that musical training might enhance how senses interact. Despite repeated confirmation of anatomical and structural changes in visual, tactile, and auditory regions, significant changes have only been reported in the audiovisual domain and for the detection of audio-tactile incongruencies. In the present study, we aim at testing whether long-term musical training might also enhance other multisensory processes at a behavioural level. An audio-tactile reaction time task was administrated to a group of musicians and non-musicians. We found significantly faster reaction times with musicians for auditory, tactile, and audio-tactile stimulations. Statistical analyses between the combined uni- and multisensory reaction times revealed that musicians possess a statistical advantage when responding to multisensory stimuli compared to non-musicians. These results suggest for the first time that long-term musical training reduces simple non-musical auditory, tactile, and multisensory reaction times. Taken together with the previous results from other sensory modalities, these results strongly point towards musicians being better at integrating the inputs from various senses.